Aaron and baritone Ian Pomerantz perform in Paris. Newly arranged songs by Reynaldo Hahn and Mario Castelnuovo-Tedesco, as well as songs by Rodrigo & Schubert, and solos by John Cage and Roger Eon. Aaron performs Castelnuovo-Tedesco's Eclogues, Op. 206 for flute, English horn and guitar with Radius Ensemble. Concert also includes works by Golijov, Ruehr & Shostakovich. Aaron performs music of John Cage & J.S. Bach. Thursday Oct. 18 • Regis College • ¡Con Fuego! Aaron's Spanish music and flamenco dance ensemble, ¡Con Fuego! performs a free concert at Regis College. F13 House Concerts presents Aaron in Landscapes, Meditations & Dances with music of John Cage, J.S. Bach, Modest Mussorgsky and Isaac Albeniz. Info: to attend please contact Aaron directly for instructions. Stone Records is proud to release John. Cage. Guitar., Aaron's second CD on the UK label Stone Records and fourth solo CD. Aaron makes his Taiwan concert debut at the Guitar Summit hosted at Kaohsiung Shude University of Science and Technology. Aaron makes his Taiwan debut at the Guitar Summit at the Kaohsiung Music Hall. Aaron makes his Alabama debut at Auburn University performing solos and with baritone Matthew Hoch. Music of Bach, Rodrigo, John Cage, Vineet Shende and Keigo Fujii. Aaron performs at Troy University. Music of Bach, John Cage, Albéniz, Keigo Fujii & Vineet Shende. Aaron presents an enrichment program for the Holy Trinity Children’s Choir. A Little Lunch Music is free and open to the public. A Valentine's and New CD Celebration! – Music of Bach, Schubert, Albéniz, Gershwin, and John Cage from Aaron's latest CD - John. Cage. Guitar. Aaron returns to Oysterville, Washington for Oysterville House Concerts. A New CD Celebration! – Music of Bach, Schubert, Gershwin, Albéniz and John Cage from Aaron's latest CD - John. Cage. Guitar. Seat Reservations: write to sydneyofoysterville[@]gmail.com. Address will be given upon reservations. Aaron performs at the University of Hartford with baritone Ian Pomerantz. Music by Mario Castelnuovo-Tedesco, Joaquin Rodrigo, Francisco Tarrega and Milad Yousufi. Aaron performs Jeffrey Van's 'Fourteen Angels' for choir and guitar, guitar solos by Bach and Barrios with music director Fred Jodry. Aaron performs music of Bach and Spanish composers in a private event in Lexington. Aaron performs Transformations – Music of Bach, Cage and Spanish composers. Aaron debuts his curated series: Now Musique - Exploring New & Neglected Music. Celebrate Greater Plymouth Inc & Pilgrim Hall Museum present Aaron in a recital. Present as part of Plymouth ArtWeek. Aaron records 'Being and Becoming' by Lou Bunk. Aaron performs 'A World of Guitar' with fingerstyle guitarist and composer Peter Janson. Salem State University presents Aaron in a 3-day Artist Residency of Lectures, teaching and performing. Guitars of the East & West – Aaron splits the concert with steel string master Hiroya Tsukamoto for virtuoso guitar music from the Far East & West. The Performing Arts Department at UMass Boston is proud to sponsor a guitar workshop hosted by UMB faculty Aaron Larget-Caplan. Aaron will focus on warm ups, stretches for hands, arms and shoulders, individual hand exercises, and fretboard exercises. Participants are encouraged to bring their guitar and take part. If time allows, a brief master class will follow. Saturday, March 17 • Boston • Boston Bach Birthday Bash! First Lutheran Church is proud to present it annual Boston Bach Birthday Bash. The Boston Bach Birthday is an annual, all-day event at The First Lutheran Church of Boston featuring solo recitals, chamber music, organ recitals on Boston’s Bach organ, and a children’s event all in celebration of the music of Johann Sebastian Bach. An authentic German lunch is served around noon, and the day ends with a Lutheran Vespers service of the kind Bach himself led in Leipzig, complete with a Bach cantata. Other performers throughout the day are Colin Lynch, Denise Fan, Arvid Gast, Dolores August, Jonathan Wessler, Nelli Jabotinsky, Heather Kirkconnell, Junhan Choi, and the FLC Choir and Baroque Orchestra. Public welcome. Limited seating to 40. Aaron presents a solo recital at CSU Bakersfield featuring music by Cage, Bach, Mussorgsky, Fujii as well as a new work by CSUB professor Jim Scully. Aaron gives a performance-lecture on his editions of John Cage for guitar to students of Allan Krantz at Temple University. Aaron makes his New Jersey debut. A Amigos Casas-Palacio, Museos y Música presents Aaron solo in Madrid. Guitarras de Luthier presents Aaron solo in Madrid. Aaron joins In A Landscape: Classical Music in the Wild for an outdoor performance of the Legend of Hagoromo. Aaron returns to the Coaster Theater! Aaron returns to the Eastport Arts Center for music by Mussorgsky, Bach, John Cage, Hovhaness, Vineet Shende. Aaron and baritone Ian Pomerantz perform in Paris. Newly arranged songs by Reynaldo Hahn and Mario Castelnuovo-Tedesco. Aaron performs solo and works with students. Aaron will perform his recent arrangements of music by John Cage. Includes Aaron's arrangement of 'Six Melodies' with violinist Matt Scutchfield. Interested parties should contact Aaron directly. Where: Beaumont Neighborhood of Portland. Coaster Theatre of Cannon Beach presents a festive evening of music for all! Aaron performs an afternoon solo recital of Baroque and contemporary music. The Cathedaral Church of St. Paul presents a lunch time concert of music of Keigo Fujii, Thomas L. Read, Bach and more. Aaron performs music by Bach, Mussorgsky & Fujii for his first Groupmuse event. The Performing Arts Department at the University of Massachusetts Boston presents Aaron in a masterclass with UMB students in the new Recital Hall. Music by Bach, Cage & Mussorgsky and works from Aaron's latest CD 'The legend of Hagoromo'. The Legato Foundation & Savage Classical Guitars presents Aaron in his Long Island Debut and CD Celebration! New York Debut and CD Celebration! Music Spanish and American Composers! Spanish premieres by by Thomas L. Read and Tom Flaherty, new arrangemetns of Joquin Rodrigo and Manuel De Falla, plus Baumann and Granados! The Institute of Contemporary Art presents: Play Date – Pause, Look & Listen with Aaron. Composers include: Francine Trester, Patricia Julien, Vineet Shende, Ian Weise, Scott Wheeler, Ken Ueno, David McMullin and Tim Pence. Admission: Kids free, Parents free with accompanying child under 12. Aaron is joined by fingerstyle master Peter Janson for music from six continents. Info: www.wicn.org/programs/dreamfarm-radio • No studio audience - sorry! Axon Entertainment presents A World of Guitar at the Kimbell Art Museum. Aaron is joined by fingerstyle master Peter Janson for music from six continents. Arkansas Acoustic Music Festival solo winner Steve Davison opens. A World of Guitar in Greater Houston. Aaron is joined by fingerstyle master Peter Janson for music from six continents. Arkansas Acoustic Music Festival solo winner Steve Davison opens. A World of Guitar in Austin. Aaron is joined by fingerstyle master Peter Janson for music from six continents. Arkansas Acoustic Music Festival solo winner Steve Davison opens. A promo video shoot at The Cabin Recording Studio. Argenta Acoustic Music Series presents World of Guitar with opener Steve Davison. Artist Retreat Center presents World of Guitar with opener Steve Davison. Preston Palmer Studios presents World of Guitar with opener Steve Davison. Admission: Both events are FREE to the public. Where: NE Portland, Laurelhurst • Address will be sent upon purchase of seats via above link. Aaron's North Shore Philharmonic Debut! First Church of Jamaica Plain presents Aaron in a festive evening of virtuoso guitar! Aaron performs guitar solos by Vineet Shende as part of the Bates college Music Department’s New Music Week showcasing works by Maine composers. Music of Franz Schubert and John Cage with violist Jennifer Stumm. Aaron is joined by cellist Rafael Popper-Keizer to record Thomas L. Read's 'Concert Champêtre'. Written in 2013 for Aaron, this will be the premiere recording of the 10-min single movement work. The composer will be in attendance. The Astoria Music Festival presents Love Loss & Betrayal – A Song recital with bass-baritone Richard Zeller & Aaron Larget-Caplan. Music by Schubert, Rodrigo, De Falla, Hahn, & solos J.S. Bach, John Cage & Keigo Fujii. A World of Guitar tours in Oregon. Aaron is joined by fingerstyle master Peter Janson for music from six continents. A World of Guitar tours in Washington. Aaron is joined by fingerstyle master Peter Janson for music from six continents. A World of Guitar tours in Oregon. Aaron is joined by fingerstyle master Peter Janson for music from six continents. Nancy Hopps will open with her crystal singing bowls. A World of Guitar tours in Oregon Aaron is joined by fingerstyle master Peter Janson for music from six continents. A World of Guitar in California. Aaron is joined by fingerstyle master Peter Janson for music from six continents. A World of Guitar tours in California. Aaron is joined by fingerstyle master Peter Janson for music from six continents. Video shoot for A World of Guitar at GSI. Aaron is joined by fingerstyle master Peter Janson for music from six continents. A World of Guitar tours in Arizona. Aaron is joined by fingerstyle master Peter Janson for music from six continents. Aaron performs a private house concert in Aurora, Colorado. A World of Guitar in Boston. Aaron is joined by fingerstyle master Peter Janson for music from six continents. Oct 30 • Carlisle Chamber Orchestra"
Aaron performs "Concierto de Aranjuez" with the Carlisle Chamber Orchestra. Nov 14 • Milford, CT • Memory, myth and lullaby"
Works by Mertz, Gershwin, Schutenhelm, Albaniz, Torroba, Fujii, Tarrega, Ueno, Marquina, and Sanlucar. Memory, myth and lullaby, and color, space and virtuosity are explored in the first half, including two premieres, while Spanish classics are brought to life anew in a lively journey of Spanish classical and flamenco solos. 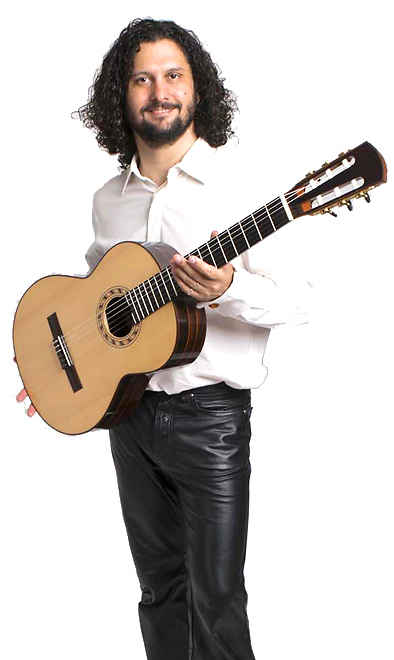 Classical guitarist Aaron Larget-Caplan is a sought after soloist and chamber musician with performances in Russia, Italy, France, Germany, Spain and the USA. He is equally at home premiering new works, performing Bach fugues or accompanying Spanish dance. He is on faculty at the University of Massachusetts Boston and formerly at the Boston Conservatory. Private Show: Aaron performs solos by J.K. Mertz, Ken Ueno, Thomas Schuttenhelm, Roland Dyens and George Gershwin. Private Show: Music from Aaron's latest CD 'The Legend of Hagoromo"
Aaron performs Ken Ueno's "Subito Sera" and Keigo Fujii's "Legend of Hagoromo"; Other performers include: Dave Gross, saxophone and Gleb Kanasevich, clarinet. When: Doors open at 7:45. Music at around 8:00 p.m.
About: Opensound is a Greater Boston concert series featuring improvisers and interpreters of avant-garde, experimental, acoustic, and electro- acoustic music. We program local and touring musicians, sound artists, and the un-categorize-able. Hailing from disparate backgrounds, styles, and genres, our musicians, dancers, video and performance artists, form a vibrant community that presents unique events in Somerville, MA. Mar 1 • From the Romatics to Modern Japan - UMass Boston"
Solo Recital in Ryan Hall at Providence College. Apr 28 • Solo Recital - Southbridge, MA"
May 5 • UMass Boston Guitar Faculty Concert"
May 18 • Yelagin Palace"
May 22 • Museum of St. Petersburg, Russia"
When: Midnight, 12am (00:00) yes this is correct! May 24 • School Performance - Moscow"
May 25 • Concert at Tabula Rasa Guitar School - Moscow"
May 28 • Private Show: Back to Today"
Private Show: Bach to Today Bach, Tarrega, and more including a world premiere of John Cage arranged by Aaron and German premieres by Kevin Siegfried, Thomas Schuttenhelm. Jun 3 • Mantova Chamber Music Festival - Mantova, Italy"
Jun 19 • Dances & Myths - Mercury Cafe - Denver, CO"
Jun 23 • Lecture: Commissioning New Composition Projects"
Aaron lectures on Commissioning New Composition Projects. Jun 25 • Dances & Dreams - Santa Fe, NM"
May 22 • Dances & Dreams - Bangor, Maine"
Aug 12 • Solo and Chamber Works - Eastport, ME"
Solo and Chamber works including Aaron's arrangement of "Six Melodies" by John Cage for violin and guitar. Aaron and cellist Rafael Popper-Keizer perform a program of Spanish music and the Boston premiere of 'Concert Champêtre' by Thomas L. Read. Russian Festival in The U.S. Salon Concert Celebrating 75 Years! Attire: No jeans or sneakers, please. Music by Bach & Scarlatti & Romantic, Spanish & Japanese composers. Premiere by Garrett Ian Shatzer. Music by Bach & Scarlatti & Romantic, Spanish & Japanese composers. Shakuhachi Master Elizabeth Bennett and Aaron Colloaborate on 21st century works for the duo. New works by Martin Schreiner, John McDonald, Jeffery Shiver, Jeannette Chechile, and guitar solos by Keigo Fujii and Kota Nakamura. Martin Max Schreiner presents a lecture on his work composing for Eastern & Western instruments. The Legend of Hagoromo - CD Release Extravaganza; Premieres by Martin Schreiner, Alan Fletcher, Thomas L. Read and Boris Rivchun. A Spanish Heart & The Legend of Hagoromo, CD Release! Of Heaven & Earth with Ayako Kato and Aaron. Admissions: Free - Just Show Up! Admissions: $15 adults, $5 students - Purchase tickets at link below. VentiCordi Chamber Music presents Two Concerts! Location: The Caledonia Grange #9 of East Hardwick, VT 05836 - Across from the The First Congregational Church. This concert is being offered as an opportunity to gather, reflect, and meditate on the atomic bombings of August 6th and 9th, 1945. The tragic effect of these events continues to be significant, even to this to this day. So, again we gather to remember and to celebrate the healing power of music, community, and our wonderfully enduring cultures. Latitudes - music by Bach, Mertz and Torroba alongside Japanese works from Aaron's CD. Music from Spain, Japan and the US, by Albéniz, Sanlucar, Takemitsu, Fujii, Gershwin and Siegfried and New Lullabies. Music by Toru Takemitsu (originals and arrangements of Gershwin and Arlen), Leo Brouwer, Keigo Fujii, and premieres by Kota Nakamura and Ken Ueno. Music of the East by Toru Takemitsu (originals and arrangements of Gershwin and Arlen), Leo Brouwer, Keigo Fujii, and premieres by Ken Ueno, and West by Albéniz and Marquina. An evening of dances and serenades, evocations of nature, new lullabies and re-imaginings of popular American songs, with music by American, Japanese and Spanish composers Toru Takemitsu, Keigo Fujii, Leo Brouwer, Harold Arlen, Isaac Albéniz and a premiere by Ken Ueno. Program: Conrad Susa's Carols and Lullabies: Christmas in the Southwest for marimba, guitar and harp, plus villancicos, carols, and motets from the New World and the Old, followed by carols for all to sing. New England Conservatory presents a Concert of Electronic Music. Exploring French, Spanish, English and Chinese culture through the program Passion and Thought in Song, Betany and Aaron find inspiration in the themes of love, loss and life. The duo performs music of three centuries including lute songs and a cantata by John Downland, G.F. Handel, Spanish dances by Manuel De Falla, love songs of Reynaldo Hahn and contemporary sounds of Eastern philosophies of Benjamin Britten’s Song for the Chinese. The Memphis International Guitar Festival directed by Lily Afshar presents concerts, masterclasses and an international competition. Program: Music by Gershwin, Takemitsu, Keigo Fujii, Albeniz and more. Programs: Virtuoso Music of the East & West from Japan, Spain & USA. Includes the world premiere of Lullabye by Ricardo Ordiozola. Aaron and the New England String Quartet collaborate to record 'Capricci' by Thomas L. Read for Parma Record Label. Look for a December 2012 release. Brown University's Italian Studies presents Music Between Nation and Form: Mario Castelnuovo-Tedesco and the Boundaries of Italianità. Information: Brown Univ. webpage click Here. Program: Music of Ernesto García de León, J.S. Bach, Oscar Valdez, Leo Brouwer and more. Program: Music by Britten, Berkley, Dodgson and Leisner for voice and guitar. Glenn Kurtz, author of "Practicing, A musician's return to music"
Saturday, Jan. 26 • Chamber Music Benefit • Belmont, Mass. The Judith K. Record Memorial Conservation Fund presents a chamber concert. Ecologues by Castelnuovo-Tedesco with flutist Meghan Jacoby and Boston Symphony Orchestra's Robert Sheena, English horn. Strings Around the World with Irina Muresanu. Program: Bach to Today, Music by Siegfried, Carter, Bach, Wheaton College student composers, Spanish composers and Ravi Shankar. Saturday, September 3 • Bourne, Cape Cod, Mass. Bourne United Methodist Church welcomes Aaron 2nd-annual performance. Program: Music from the 18th, 19th, 20th and 21st century by Bach, Albéniz, Sanlucar and new works by Schuttenhelm and others. Program: Premieres by Alan Fletcher, Patricia Julien, and Jacob Mashak. Music by Thomas L. Read, J.S. Bach, Isaac Albéniz, Esteban Sanlucar and more. Program: Boccherini - Fandango, Rodrigo - Concierto de Aranjuez, Debussy & De Falla, and two works by Cape Cod composers: Hayg Boyadjian's Mi Tango and the world premiere of Whispers a new lullaby by Canary Burton. Program: Boccherini - Fandango, Rodrigo - Concierto de Aranjuez, Debussy & De Falla, and works by Kevin Siegfried and John Thomas. Dance, Love, Sleep – Spanish and flamenco dances, Argentine Tango, Venezuelan waltzes and serenades. New music by Hayg Boyadjian. Dance, Love, Sleep, Bach - Spanish classical and flamenco dances & serenades, Argentine tangos, Mertz, Bach, and new music by Hayg Boyadjian & Alan Fletcher. Dance, Love, Sleep, Bach – Spanish classical and flamenco dances & serenades, Argentine tangos, Mertz, Bach, and new music by Hayg Boyadjian & Alan Fletcher. Music by Astor Piazzolla, Ravi Shankar, Toru Takemitsu and Antonio Lauro. The Diavolo Duo in Newton, a GBHConcert! The Diavolo Duo on Cape Cod! Music by J.K. Mertz, New Lullabies by Thomas Schuttenhelm, Alan Fletcher, with some Spanish music. Sextour Mystique by Heitor Villa-Lobos. Flute, oboe, saxophone, guitar, celeste & harp. A New Lullaby Project Premiere Concert! New Lullabies by Alan Fletcher, Thomas Schuttenhelm, Michael Veloso, Francine Trester*, John McDonald*, Hayg Boyadjian*, Demetrius Spaneas*, Martin Schreiner*, Canary Burton, Patricia Julien, Jacob Mashak & Thomas L. Read. Meet nationally known The Boston Conservatory guitarist Aaron Larget-Caplan and see some of the tools he uses on his Mac to create and manage his music projects and his career. He’ll perform tracks from his latest albums, New Lullaby and Tracing a Wheel on Water, and he’ll talk about how he writes and records his music. A New Lullaby Project Premiere Concert (Dec. 10 program)! presents Aaron Larget-Caplan in an interview and performance. Performances of New Lullabies by Jonathan Feist and George Gershwin. Tickets: $15 adults, $12 stu/sen. Program: Boston premieres of New Lullabies by Fletcher, McDonald, Spaneas & Boyadjian. Ashley Addington, flute, and Rachel Arnold, cello, & The Vortex Other Dimensions Ensemble. Aaron is the guest musician for the Sunday service. Program: Gershwin - Cuban Overture, Rodrigo - Concierto de Aranjuez, Dvorak - Symphony #7.